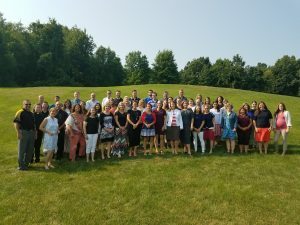 Everest Collegiate High School & Academy faculty and staff officially launched the 2018-19 school year on Monday, August 13 with the return of the teachers after summer break. There are several new faculty and staff members joining the Everest team this year. After Mass together celebrated by Fr. Daniel Pajerski, Fr. Thomas Salazar, and Fr. 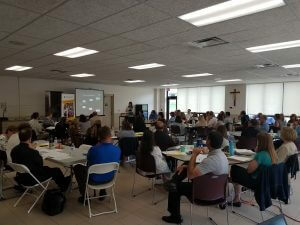 Brian Hoelzen, the planning week began with introductions of new members and a presentation on mission from fourth-grade teacher, Jordan Mitchell. This week consists of various meetings and presentations for the faculty and staff, the opportunity to work by departments, and time for the teachers to set up their classrooms.